Finnish-Russian Expedition Cho-Oyu 2000 is organized by the climbing association ERSH TRAVELS (Andrew Yershov, the head) at substantial support by CET Neva (Anatoly Moshnikov, the director). Mt. 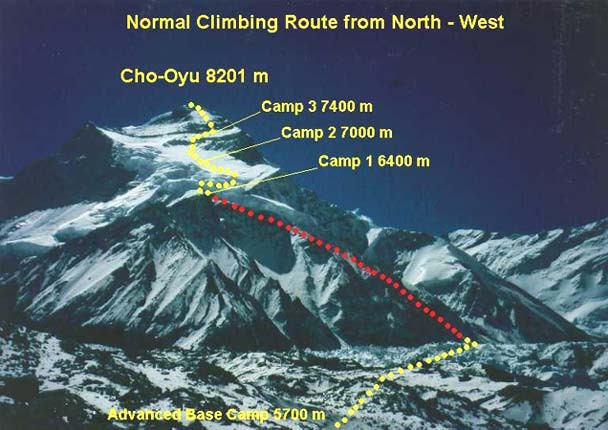 Cho-Oyu is planned to be ascended via the normal route from NW, from Tibet. In Nepal and Tibet the Expedition is served by Thamserku Trekking & Tibet Mountaineering Association. The Expedition is funded from personal resources of the participants. Three higher camps are planned: 6400m, 7000m and 7400m. Finnish participants have a satellite telephone, so some immediate information from the Expedition seems to be available. All the photos below had been taken during Austrian spring expeditions 1997-1999. May 21 the expedition members had flown back from Katmandu, and May 24 Marina returned back to St. Petersburg. Three Russian participants - Oleg Nasedkin, Eugene Kuzmin and Marina Yershova - have managed to overcome all the difficulties and summited Mt. Cho-Oyu May 10 and 12. Marina became the first and the only Petersburgian woman who worked out the ascent of an eight-thousander and she has it made directly from the Camp 2. This is our great distress that two of the expedition members - Noora Toivonen, the Finn, and Paul Bonadysenko from Irkutsk - have disappeared May 5 at the summit attempt. We present our condolences to their parents, relatives and friends. I hope Marina and other participants to write, a little later, some articles describing the expedition and the tragedy. - very bad weather conditions of this year, with clouds covering the summit, snowing and strong wind in almost every afternoon. Since very early phase of the preparation, a great attention was given to planning the entire expedition and the acclimatization process, in particular. Our leading climbers, Anatoly Moshnikov and brothers Shustrovs, with their himalayan experience, helped much us in our preparatory efforts. 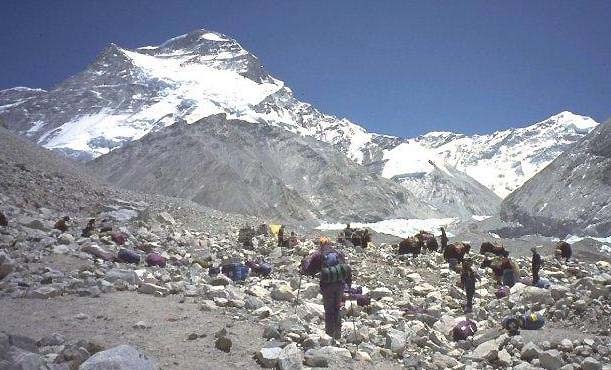 Main ideas of the plan turned out to be right, and the three Russian climbers, who were exactly following it, were able to install three higher camps with no support from others and then could climb up the top. It was a pity, but Paul, basing on his personal climber experience, denied to follow the plan and expedition leader's directions. It resulted in significant overload at first forays above Base Camp after that his organism could not recover, and finally his acclimatization appeared to be insufficient. Something analogous happened with the Finnish climber. After first days when she had, probably, a light form of the mountain sickness she had begun to make up too fast for lost time. The result was the same: loss of forces and lack of acclimatization. This was why they were so slow at their summit day and at noon were still seen in 1.5-2 hours below the top. And at 14:30 clouds hid the summit and it began to snow. 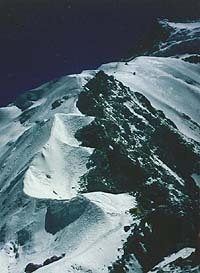 Nobody knows what happened there because no other expeditions were in vicinity of the top that day. One can only suppose that at no visibility they had lost right way, came to some steep slopes and fell. Anyway, neither our climbers nor others had found any their traces. It should be noted in addition, the leadership is rather difficult task in such kind of expedition where the members pay there own money, and a lot of it. In this case the expedition leader has no real tools for affecting the participants. If they agree with the leader and follow to his/her directions everything goes well. If the participants deny to subordinate to the leader, this results in some inner problems and even in an accident, that was the case in our expedition. Multiple Marina's appeals not to undertake a summit attempt during that ascent were ignored, and two men were lost. Since long ago Westerners used to practice written members' commitments where they either promise to subordinate to the leader or disengage him/her from any responsibility. I think this was my fault when I had relied upon a rationality of our participants and did not collect those commitments. Thanks once more for the expedition coverage on your site. It will be my pleasure to present you newer and more detailed materials upon the expedition when they are ready. Our expedition has turned to way back. Yesterday all the participants walked and all our loads were carried by yaks down to the Cinese Base Camp at 5000m. Here is sunny and warm and this is great after many days spent among snows, on frost and wind. Today we are waiting for Chinese jeeps to bring us to Zangmu. Probably, tomorrow we'll come to Katmandu. So far we prepare different documents with help of our liaison officer. The mood is bilateral. On the one hand, we are glad that three of us (may be, five) got on the Cho-Oyu summit among the firsts this year, but on the other hand there is a bitter not going away because of the loss of two our friends. I've summited May 10 directly from the Camp 2 together with Sherpas of the Iranian expedition. There was much snow and we were forced to work hard making the steps. The pace was rather low. I returned back to the Camp 2 at 8 P.M. and down to ABC yesterday. The ascent finished for me with minimum losses: ski pole, jumar, somebody has stolen my carrymate, and both big toes turned out to be frostbitted a little. Nasedkin and Kuzmin took decision to assault from the Camp 3. Today about 2 P.M. they had been atop and descended to the Camp 3 tent by 5 P.M. We expect them to arrive to ABC tomorrow. "Korean team who summitted 9.5 saw some footsteps going from the first top to the left, to Nepal. They have lost the trail and maybe the bodies will never be found. Marina summited yesterday and are coming today to the Basecamp." ...I've received a message sent by Jorma Alanen via our common friends' e-mail. There he writes that two climbers, Noora Toivonen and Paul Bonadysenko, disappeared when climbing Cho-Oyu. May 5 early morning they had left the Camp 3 for the summit. They did not return back and till the present nothing is known about them. Probably, they have died. He informs further that yesterday (i.e. May 8) Marina, Oleg and Eugene had departed upward. They had intention to climb the top and, may be, they would find out the climbers disappeared. However, actually there are no chances for them to stay alive until now. It is difficult now to discuss the tragedy causes because there is no information detailed enough. Apparently, the weather conditions have played an important role - for all of last days they were bad - cold and really stormy wind. Yesterday Oleg, Eugene and I had come down to ABC after our third ascent. May 2 we had set our tent in the Camp 3, 7400m. We were thinking about the summit assault but it turned out to be absolutely impossible because of the weather conditions: cold as in hell and terrible wind. Sometimes the wind blasts almost tore off us from the ground. And nobody from other expeditions did any summit attempt. Iranians and Koreans who started earlier also postponed the assault after spending a couple of days in the Camp 3. Oleg and Eugen work very well. All three of us have good physical conditions and perfect acclimatization - for all the passages between the camps we expend not more than 4-5 hours. Participants of other expeditions observe us with a respect because nobody of them but the Sherpas is able to walk so fast. Our Suomi seem to have understood what they should do on the mountain and moved up. Noora and Jorma are in the Camp 2 now and the others are going to climb up as well. Bonadysenko is in the Camp 3 now. He radioed that the wind has overturned our tent. We try to keep a hope that nothing of the gear has flown away. Our present plan is to have a rest for a couple of days more in ABC and then we'll attempt for the summit. This will be our fourth, and probably deciding, ascent. I do not think we have forces and determination for the fifth one. If no changes emerge it will look like following: May 7 - Camp 1, May 8 - Camp 2, May 9 - Camp 3, May 10 - summit attempt. Diagram height vs date of the expedition. We have shifted our ascent by a day and spent the day of April 22 in ABC. April 23 Oleg, Eugene, Pasha, Jorma and myself left for Camp1. The acclimatization has yielded its fruits, and even having rather heavy sacs on our backs we had reached the Camp 1 in 4 hours - not so bad because it is only the best sherpas who can demonstrate such a speed. April 24 there was intense snowing and we were spending for whole the day inside the tent. On the next day we were climbing up and at the altitude of about 7000m had set up the first tent of the Camp 2. The altitude up there was some about 7000m. When climbing through the icefall we fixed a rope and one more - a little bit higher. Frankly speaking, scales here are rather impressive: the way between Camps 1 and 2 takes 5 (for well acclimatized sherpas) to 8 hours. The night in the Camp 2 was good, except for the only thing - we were very tightly in the tent because all the five were sleeping in the unique tente. The way down to ABC took only 4 hours. All this sounds optimistic though it's not so simple. Only three of us could actually climb above the Camp 2 - Oleg, Eugen and myself. Pasha can't recover himself after his too hurry evolution through the Camp 1 and was able to carry only a minimum loading and Jorma decided that time not to ascend above the Camp 1. The rest Finnish participants are very passive and produce no real help. Tonight we intend to talk a little with them... We three are not capable physically to deliver all the necessary gear for three higher camps. Now we'll have a rest for 3 days or more in ABC - we should be competely recovered before our climb for the 3rd camp on 7400m. The plan for the next ascent is as follows: ABC (5700m) - Camp 1 (6400m) - Camp 2 (7000m) - organization of the highest, assault camp. Then, then... let us see. If our conditions and the weather will OK, then perhaps, we'll make the summit attempt. From the Camp 1 to ice cliff. The generator has been repared with common efforts and now we have no problem with the satellite telephone. Yesterday all the Sherpas headed by the lama were celebrating their holyday - decorated the Camp with Buddha's images, flags. We and others took part as well. Iranians had also brought some portraits, perhaps, the Saddam Hussein ones and installed them close to those of Buddha. Today morning the summit had been closed with huge cloud similar to a cap. People joked that local Gods were angry, however later the weather recovered. Two younger Finns, Arto and Tomi, revived at last and has left for the Camp 1. We continue having the rest and tomorrow plan to go up for bringing something to the Camp 1, and then will try to set up the Camp 2 on 7000 m. Altogether it will take three days. Sherpas say that the route condition is quite different as compared with that of last year. Besides ice pitches in the icefall there is a part of slope between 1st and 2nd camps of 200 m long covered with clear glancing ice. A Korean told me that we had a meeting on Khan-Tengri and Pobeda expedition in 1992 but I could not recollect this. He plans to climb up the summit having started from ABC and to descend back in the same day. He has already a night spent in the Camp 2. Koreans allow to use their fixed ropes on the icefall for a charge. Americans have decided to pay but Iranians (wise people of the East!) plan a barter: they are going to fixe their ropes higher for leasing. Koreans agreed. Probably we'll fix our own rope or act in the same way as Iranians. April 18 Oleg, Eugene, Jorma and I had left for Camp 1 carrying rather "good" sacks. We were walking totally for about 6 hours: for 3 h. up to 6000m and then for 2-3 h. on very unpleasant moraines before the crest. It's here, at the altitude of 6400 m that our tents of the Camp 1 stand. The night passed OK and yesterday we had returned down in ABC, having spent only 2 h. Now a 2 day rest lies ahead. Pasha Bonadysenko had descended from the Camp 1 one day before us, told that it was hard, and now he considers himself to be too husty. Four Finns continue staying in ABC. Noora seems to be not yet recovered after her sickness and the others do not look like burning with the desire to ascend as well. We are going to make change their mind. Yesterday the Sherpas had put the Camp 2 for Iranians and Koreans. They were long enough working on the icefall at 6800 m - too much snow. Today there is a Buddhist holiday, a lama has come, thus we're going to celebrate. Our generator has broken so we'll have some problems with charging batteries of the telephone and the radio. Hope that either we repaire it or arrange this with other expeditions. Cho-Oui, view from the Camp 1. Yesterday for whole the day we had been improving our Camp and then were walking shortly in the vicinities. The weather was good and the sun was shining till the end of the day. Noora and Jukka has joined us in the ABC but having plumped down $55 for the personal yak - one should better do everything in its scheduled time and not lag behind, otherwise an additional Chinese service costs a lot. Today all the Russian participants and Jorma has made an acclimatization ascent up to 6000m. It was a rather long way that has taken 3 hours. The path is marked very distinctly, nevertheless Jorma tried to have lost himself. Pasha (warm and familiar Russian form of name Paul - S.K.) Bonadysenko had intention to continue ascending up to Camp 1 at 6400 m. He has just radioed us that has already installed the tent in the Camp 1 and would be sleeping up there. Tomorrow we also plan to go up to the Camp 1 and to set the rest of tents in it. Now two big expeditions, the Iranian one and the Korean, are intensively working on the route, other expeditions are either on the approaches or in the Cinese BC. 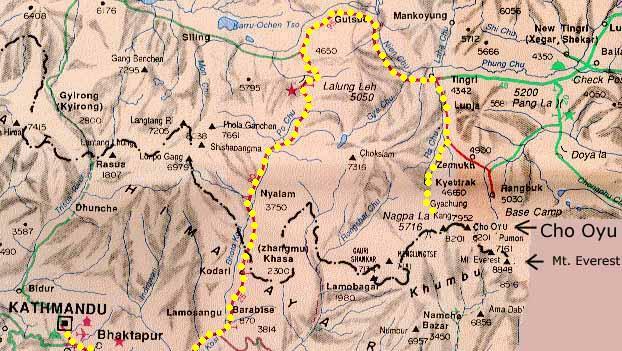 Both the expeditions mentioned use Sherpas' help - their Sherpas have already prepared the Camp 1 and equipped the way up to the Camp 2 with fixed ropes. Probably, tomorrow or after tomorrow the Camp 2 will be organized. We are permitted to use their ropes - thank them - this facilitates our climbing. Mr. Sadyk, Iranian expedition leader and President of the Iranian Climbing Federation, asked to send his greetings to V. Shataev- that is just I do. Today we have arrived to ABC at 5700 m and have our tents already installed. This locality will be our Base Camp for the whole expedition period. The way from the Chinese Base Camp was rather long ant has taken two days. Yesterday we were walking for 4 hours, today - 5 hours. We had yaks in plenty, probably, this is a result of our warm relations to the Chinese liaison officer - after a bottle of good cognac as a present he had understood our needs very well. Since the stay in the Chinese Base Camp it is the Nepal cook who serves us. He is a real talent: fried eggs, potatoes, soups, all of these are habitual and preferred meals both for the Russians and for the Finns. Whole the our team is enjoyed because, frankly speaking, the Chinese meal, in spite of being absolutely good, has become to be bored during the travel. The Finnish participants are very disciplined when coming exactly at the time for the meals unlike the Russians who are always late. Pasha (warm and familiar Russian form of name Paul - S.K.) Bonadysenko, good photographer, says that the dinner time is just the proper one for making photos. Our Camp stands on the moraine, 100 m above the glacier. There are many other expeditions around us - those of Iran, Korea, Brasil and so on. Now we are at the altitude which exceeds altitude of Elbrus summits, this is why all of us wear down jackets. The last days weather looks like following - blue sky and sun in the morning and it is snowing in the evening. Perhaps, this is a local pecularity. The most of us are okay. Of course, it is not surprising for this altitude if someone has a headache and another complains about the throat. Noora is ill a little - she and Jukka decided to spend a couple of days in the Chinese BC. Cho-Oyu and vicinities of ABC. We are OK here. Yesterday we had arrived to the Chinese BC at 5000m from Zangmu via Nialam and Tingri. Several acclimatization ascents were made during the trip. The sun is shining but it's cold due to the high altitude. We plan to leave for ABC tomorrow. 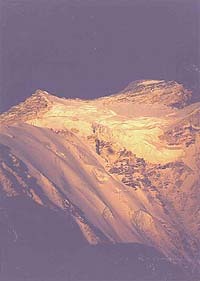 It will be our principal base at some 5600-5700m. The march should take two days because we don't want to rush for better acclimatization. Yaks will transport all our things. Chinese met us rather warmly. Liaison officer, the main person here, promised all the possible support in a case of necessity. There are many expeditions here: two from America (about 30 persons each), one from Iran or, maybe, Iraq, etc. Three expeditions work already on the mountain. 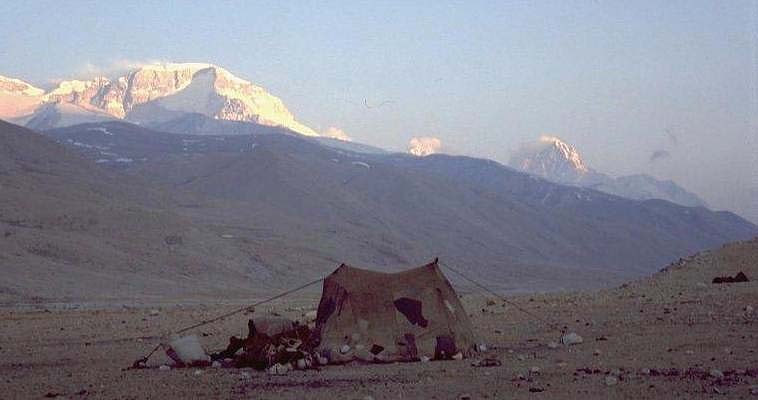 View to Cho-Oyu from the Chinese Base Camp. Mt. 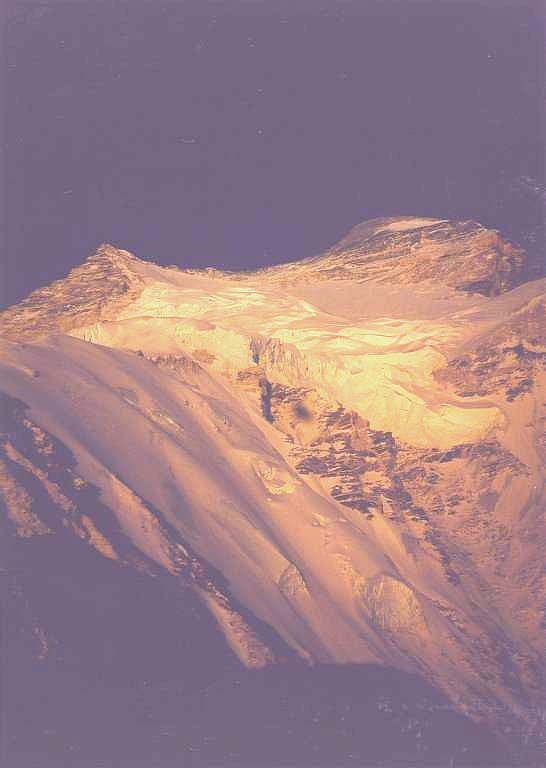 Everest (on the left) and Cho-Oyu from Tingri. Yesterday morning we left Katmandu, then crossed Nepal-China boundary and by the night arrived to Tibet town Zangmu. It was alright with the transfer though we had some work carrying our things just before the custom house because Chinese were repairing the road. Custom checking was rather "formal", and we have passed through it having lost nothing - our radio, satellite telephone, sausage continue travelling with us. There were some problems in the hotel. It is much worse as compared with that in Katmandu. But we were prevented yet in Petersburg. An angry face and an discontent expression had resolved the problem. The local meal is tasty, similar to that in the Chinese restaurant in Petersburg. It's rather cold in Zangmu and no wish to take off the Polartec arises. Now is morning here and we are loading up our baggage and then are going to depart for Nialam. April 2 our expedition had landed in Katmandu. It's hot in the town - +20° to +25°, the night temperature is +15°. Katmandu is noisy and crowded; dust, rickshaws, cars are all around. Terrible impression. There is no desire to walk over the city - the better is to stay in the hotel the more so, that our Royal Singi Hotel is perfect, much better that the hotel where the Moscow team lives. We have good rooms and excellent air condition. During these last days we purchased additionally a necessary equipment like rope for setting fixed on the route, snow pitons etc., checked the gear and food supplies from Focus and Thamserku Trekking, made an acquaintance with our cook... So far all goes well. We have already new tents North Face, electric generator and portable hyperbaric bag to be brought to the Base Camp as it has been agreed previously. Besides, in addition to the hyperbaric bag we take a medical oxygen - a couple of bottles and a mask. Our partners and Nickolay Cherny from the Moscow team helped us in this. Following to rumours, some eleven expeditions will be on Cho-Oyu this summer. Two of them have already left for Tibet. Today morning we should go away as well but because of riots in Katmandu the departure is postponed for tomorrow. Both Russian and Finnish participants are okay and have the only wish to find themselves in the mountains as soon as possible.